There is nothing quite like going from 0 to 60, which is a bit what this match feels like. Arsenal were on a great run of form before the international break brought a halt to proceedings. Now, that break is over, and Arsenal are thrust straight back into action with an early Saturday kickoff against Liverpool, in a huge matchup for top four placement. Arsenal sit third in the league table at the moment; winning the league is now but a pipe dream, but second place Manchester City are just one point ahead of the Gunners. Meanwhile, Liverpool's loss to Manchester United just before the break leaves them five points adrift of fourth place United and six points behind Arsenal. An Arsenal win tomorrow would leave the Gunners nine points clear of Liverpool with seven games to play. A Liverpool win, however, would leave Arsenal just three points clear, and with United playing Aston Villa this weekend, an Arsenal loss could leave them back in fourth by the weekend's closure. It's a critical match for both clubs, but with Liverpool's key absentees and Arsenal's home advantage, it certainly feels like Arsenal's game to lose. Whether that's good or bad is subject to your own interpretation. injured players in one shot? As you likely know by this point, all four long-term absentees (Jack Wilshere, Mathieu Debuchy, Mikel Arteta, and yes, even Abou Diaby) took part in a behind-closed-doors friendly against Brentford earlier in the week. Jack Wilshere had a goal as Arsenal ran out 4-0 winners. Combine that with the fact that Alex Oxlade-Chamberlain is also now back in full training and it sounds like Arsenal are very nearly back to having a fully available squad! Ah, but not so fast! This was an international break after all and the report is that Danny Welbeck is a doubt after tweaking his knee with England; he had been sent back to Arsenal after the England match on Friday. There are a lot of question marks in Liverpool's lineup, so let's dive right in to the doubts. A trio of players missed international time with England, as Adam Lallana pulled out with a groin injury, Daniel Sturridge withdrew from the national team after tearing a hip muscle, and Raheem Sterling had a toe injury. Sturridge and Sterling are both expected to play through the pain, though the same is less certain regarding Lallana. Meanwhile, much maligned Dejan Lovren pulled out of Croatia duty with an abdominal injury. However, with Martin Skrtel suspended for three matches after his stamp on David De Gea at the end of Liverpool's loss to United, Lovren might have to slide straight back into the side. Lovren has not started a league match since March 4, when Mamadou Sakho was injured. Elsewhere, Steven Gerrard is suspended for three matches as well after his 38-second stamping cameo. Jordan Ibe is out with a knee injury, as are Jon Flanagan and Jose Enrique. Brad Jones is out with a thigh injury, though third-string goalkeeper Danny Ward is now on loan at Morecambe. Predicted XI: Mignolet, Can, Toure, Sakho, Markovic, Moreno, Henderson, Allen, Coutinho, Sterling, Sturridge. while Gabriel somehow rests his arm around the league table. All winter, the talk was that Liverpool were the in-form team in the league. They were in 10th place after losing to Manchester United on December 14. Their draw against Arsenal on the 21st (discussed in the section below,) kicked off an unbeaten run of 13 matches, including 10 wins, that saw the Reds climb to fifth. Of course, they still can't seem to beat United, and that unbeaten run came to a grinding halt just before this past international break. So, for all the talk about how in-form Liverpool were, they have 10 wins, three draws, and one loss over their last 14 matches, picking up 33 out of a possible 42 points. Arsenal, over the same time period, have 11 wins, one draw, and two losses, picking up 34 out of a possible 42 points. So really, the in-form team in the league since Christmas, has been Arsenal. Arsenal's six-match winning streak in the league is their longest such streak within a single season since the spring of 2012, which was a seven-match winning streak. Arsenal did win six straight across this summer as well, winning the last five league matches of last season and the first of this year. WHY IS EVERYONE GETTING OUT OF THE WAY? You likely still recall what happened at Anfield last season, possibly to the point where you forget that Arsenal beat Liverpool twice at the Emirates. Last November, Arsenal won 2-0 against the Reds as they remained top of the table and passed their first major test of the season (oh, they failed so many later, but just bask in that memory for a little bit.) A week after losing 5-1 in Liverpool, Arsenal responded by defeating Liverpool 2-1 at home in the fifth round of the FA Cup, en route to raising the trophy. 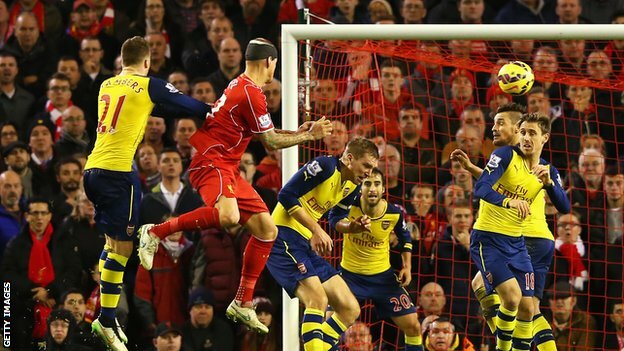 Prior to those two wins, Arsenal had failed to beat Liverpool at the Emirates in three tries. During that winless streak at home, Arsenal actually had a better record against Liverpool at Anfield, where they had not lost since the 2008 Champions League quarter-final. Earlier this season, Arsenal nearly stole all three points from Anfield when their performance didn't really deserve it. Of course, a Martin Skrtel head injury added a billion minutes of second half added time, only for Skrtel to score the equalizer with that head to see the match end 2-2. Arsenal have only lost twice to Liverpool in their last 15 competitive fixtures across all competitions. Nine of their last 19 meetings have ended drawn. Why is Anthony Taylor hanging out with Wojciech Szczesny? Why are they in the net? The referee is Chester-based Anthony Taylor. Oh, great! After last season's opening match debacle, Arsenal did not have Taylor again until this season, for the 1-1 draw at Leicester. He was also involved in the 3-2 loss at Stoke, in which he harshly sent off Calum Chambers for two borderline yellow cards. Since that match, however, Arsenal's luck with Taylor has turned a bit; he took charge of the 5-0 Arsenal win over Aston Villa (a far cry from that fixture last year) and replaced Chris Foy to finish off the 3-0 win over West Ham. Liverpool's record with Taylor in the middle this season is mixed; the Reds lost 2-1 to Chelsea on November 8, won 1-0 at Burnley on Boxing Day, and drew 0-0 in their derby at Goodison Park against Everton on February 7. Fixture moved for Aston Villa's FA Cup Semi-Final on April 19. John Painting is a contributing writer to the Modern Gooner and secret agent for the uhhh, regular person, totally. You can follow him on Twitter @zorrocat or visit his soon-to-be official Web site, http://www.johnpainting.ninja.